At some point, you’re going to get to your campsite and realise you forgot your grill. When this happens, you have two options. You can use the stove and save an infinite amount of work and trouble, OR you can make a new cooking station out of fire and rocks! Obviously, you should go with fire and rocks. Making a hot rock requires a lot of patience, some danger, and ideally the right type of rocks. There are a few ways you can do this, but the job becomes a lot easier if you are able to find a large flat rock. This isn’t always possible, but we’ll start by looking at how this would work if you were able to find one. Start by creating two parallel rows of normal rocks. Clean and place the flat rock overtop these, creating a small table with about 6 inches of space underneath it. The rows of rocks should block off two of the sides, leaving an opening at the front and back. Insert kindling and small branches into this space and light it up! 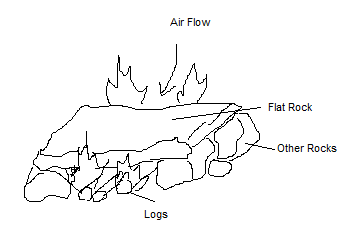 The fire should be underneath the flat rock, with air flowing through the openings to help keep it lit. You’ll need to continue feeding the fire for some time in order to sufficiently heat the rock. You can start by feeling the rock with your hand, but after a while you’ll have to use indirect methods to determine how hot it is, like dribbling some water on it, or using another item to test the heat. Once the rock is hot enough, you can cook just about anything on top of it that you could on a normal frying pan, although it will not be non-stick. If you do not have a large flat rock, the alternative is to use a smaller flat rock (as flat as possible), and heat it up by putting it in the fire itself. Before doing this, you’ll want to clear a path away from the fire to a cleared, fire-safe area. When the rock is hot enough, you can use a large stick to push or drag it out through this path, and then move it to your cooking location using some larger sticks, or by dragging it further. This method is a lot more dangerous, as it involves moving a heavy hot rock, but if you are careful, it can work as well. Remember to clean the flat surface of the rock before heating it, and then be very careful to keep that portion clean when you are dragging it. Older PostHow do I cook on a fire?